As a white, bisexual male writer and avid music lover, I will admit that I felt like the object of the anger and eerie rage of this space-pop duo. This, I realize, is exactly how I should feel. She Persisted is an album that both calls attention to and calls out, rebukes and rebuttals, the patriarchy. After the events over the past year, it’s surprisingly refreshing to have a group come forward and protest, using any kind of art, against an American society as well as a Presidency that, due to all credible evidence, cares very little about/for women. This entire album is one of a psychedelic dream-pop protestation against the patriarchy. It resembles very much plenty of protest songs from the 60’s and 70’s, only with low-fi beats, alternating synth melodies, and a Gaga like singers. This album is comprised in a way that continually re-centers and re-affirms itself; by using interludes, that have similarities but differ in much more complex ways, before major songs, the album feels as though it is a complete, organic piece of art. Each interlude utilizes bleak, melodic sounds, inharmonious effects, and deep reverberated bass to paint soundscapes of either anger or eerie frustration in a fashion akin to having a lioness stare you down from the low grass knowing well that it is the female that hunts. Much of the subject matter centers on entitlement and the ignorance therein by having it as well as domestic violence and abuse of women. The main song, Entitlement, continually returns as a reprisal melody throughout and re-centers the listener back to the main idea of the album: our society as we know it is fucked up thanks to the patriarchy and its ability to spread ignorance among the masses and thus cause other men, mainly white, to feel entitled to things that they have no right to feel entitled to have. One line that struck me throughout this entire album was in the title track: “either we’re your equal or your adversary.” If that doesn’t sound like pain and bitterness I don’t know what does. Rightfully earned however. Within the cosmic-pop melodies, there is an anger in both singers that can be tangibly felt and, therefore, must be earnestly deserved. The middle track, a cover of Pure Imagination (from Charlie and the Chocolate Factory), is an utterance for both women and feminists everywhere to not stop dreaming and hoping for world where men get it. Where women and men are on equal footing and treat one another, specifically the men towards women; where prejudice/racism/sexism and entitlement are not ideas and realities underlying our society, but sick memories. The most compelling track, and my favorite, was “But I Love You” which re-envisions an encounter between a speaker of the song and a man and reconsiders the vantage point in the occurrence of domestic violence. It haunted me and reminded me that men and masculinity is a fragile thing, specifically toxic masculinity. To possess something is not to entirely love the thing possessed, and this duo reminds us of this, as well as the brittle process of thought behind domestic violence, within the lyrics. It made me question myself harder on what I think masculinity is, something that I struggle with, as well as made me feel sadness and disgust at my fellow men as well as at myself. Not pity, but reprise. Not woe-is-me, but do better/do more. This album is a trippy, star-glittering, feministic recount of this infamous year. The duo pours their ideals as well as their passion into this encompassing work and what it means to use art to protest, as all art is political whether or not we recognize the politics within it. 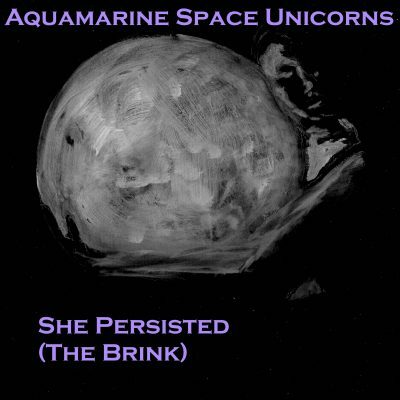 Aquamarine Space Unicorns use their music to paint soundscapes that not only unite women but also charge the atmosphere around the listener with proposals that need to be continually asked as well as continually felt.